This summer, the country’s number one fast-food chain is gathering Filipinos across the country as one big happy family for the Jollibee Family Bee Day. Dubbed as the grandest family picnic ever, it will be held simultaneously across the Philippines in five venues—Quirino Grandstand in Metro Manila, Bayanihan Park in Pampanga, Nuvali football grounds in Laguna, Plaza Independencia in Cebu and Crocodile Park in Davao – on May 10 (Saturday) from 2-5 pm. The grand family picnic will feature exciting performances from guest bands like Callalily (Manila), 6 Cycle Mind (Pampanga), Moonstar 88 (Laguna), Spongecola (Cebu) and Imago (Davao) as well as celebrity performers for each leg. There will also be raffle prizes, and side activities for the kids. To be a part of this one-of-a-kind picnic, simply visit any participating Jollibee store from April 12 to May 9, 2014 nearest to your preferred picnic venue. Tickets are sold for only P150 (with any food purchase) and comes with a set Jollibee picnic meal (Jollibee Yum with Cheese, Peach Mango Pie, bottle of mineral water and tetra-pack juice) good for one pax which will be distributed on the day of the event plus a special Family Bee Day cap. So get ready with your picnic mats and gather all your family, relatives and the whole gang for a family picnic like no other! For more details, visit www.jollibee.com.ph. 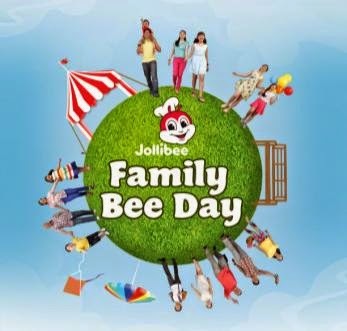 Filipinos are set to celebrate as one family at the Jollibee Family Bee Day: Grandest Family Picnic, happening on May 10, 2014!